Age In Place Home Care, as well as 35,000 other festival goers, braved the heat to enjoy the 12th annual, Taste of Hamburg-er Festival on Saturday, September 5th. 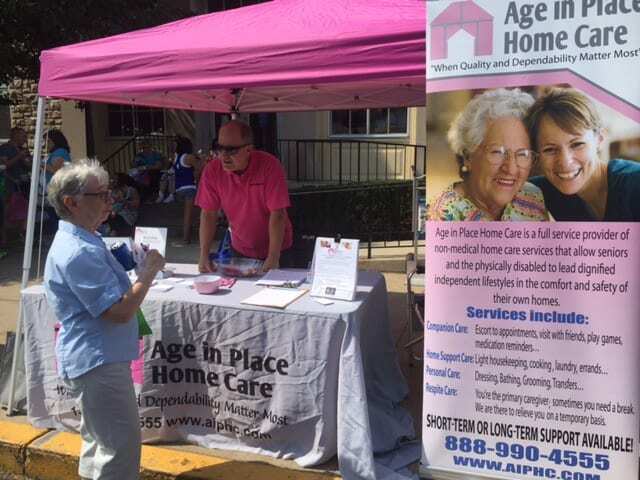 Age In Place Home Care’s table was once again located in front of the Hamburg Post Office on N. 3rd Street in Hamburg across the street from the Hamburg Senior Center. Things have changed a bit and we are now much easier to find than in the past. Just look for the "Hot Pink" canopy and brightly colored pink shirts. You can't miss us!! We already look forward to being in the same location next year in 2016 so make sure you stop by to say hello. We would love to talk to you.